In an era of intensive development and globalization, the dynamically changing global economy creates new needs in both the theoretical approach to public management and in the practical discussion related to the perception of public management. According to emerging economic and social phenomena, there is a need for the design and operationalization of innovative solutions for managing public organizations based on trust. Issues dealing with public trust are hardly a novelty. Research to date, however, has failed to address questions on what changes need to be brought about throughout an organization so as to make it capable of creating and restoring trust within public organizations as well as in inter-organizational relationships. The current state in this respect is not known. Our book is an attempt to partially bridge an existing gap. In today’s public management, two trends explicitly come to the fore. The first emphasizes creativity in problem solving, whereas the other involves increasing capability to establish relationships not only within the public sector, but also through collaboration with organizations from other sectors. Therefore, an organizational perspective on exploring public trust is gaining prominence. It covers both changes in public organizations themselves – in other words, in their internal environment – as well as changes spurred by dynamic shifts in the surroundings of the organizations and of the public management system as a whole. The main purpose of the monograph is to demonstrate that shaping relationships based on trust within and between organizations has a significant impact on the efficient functioning of public organizations. The studies presented are important in regards to the systematization of the concepts of public management and organizational change management in relation to effective collaboration between organizations; they arise from the need for management practice in the public sector. Therefore, their practical purpose is defined as formulating recommendations for managers in public organizations. Their accomplishment may foster the improved functioning of the public services. It seems that trust management can support the effectiveness of public organizations and contribute to their stable, sustainable functioning in a difficult, ever-changing environment. This book is addressed to all those interested in the issues pertaining to contemporary public management – scholars and students, as well as practitioners in the management of public organizations. 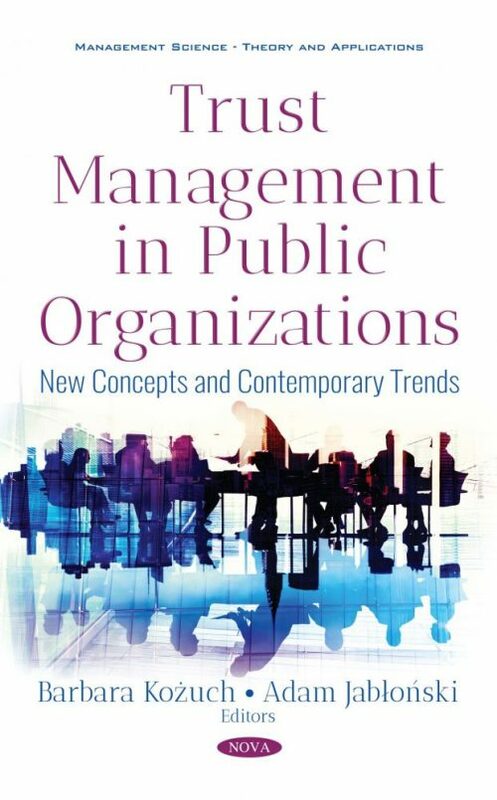 – presenting the new dimensions of public management, as seen by international authors of individual chapters, and the possibility of applying the solutions contained in the monograph. The editors and the authors hope that the combination of theory and practice presented will satisfy the needs of readers, in particular managers in public organization and public management consultants.